So the Parliamentary Labour Party has shut its doors to any kind of contest or discussion of policy around the issue of its next leader, and in so doing, has reinforced the feelings of many voters that they are no longer represented in the House of Commons at all. Gordon Brown, the true architect of New Labour, who voted for the war in Iraq, and pioneered many of the party’s pro-business policies, will be anointed as the new Labour leader and the new prime minister at the end of June. And the pretence that all is for the best in the best possible of all worlds can carry on for a bit longer. Perhaps we should not be surprised. John McDonnell, who chairs the Campaign Group of Socialist MPs, was right to accuse Brown and his supporters of a conspiracy to stop a contest, even though, publicly, Brown had welcomed the prospect. And the job of blocking a debate in the party was made a lot easier by the union leaders, who with the exception of the Rail Maritime and Transport Union and the Fire Brigades Union, dutifully lined up behind Brown. The last thing that any of the New Labour leaders wanted was a debate in which the real issues of climate chaos, poverty, inequality, the privatisation of the health and education services and many others, would have been exposed. 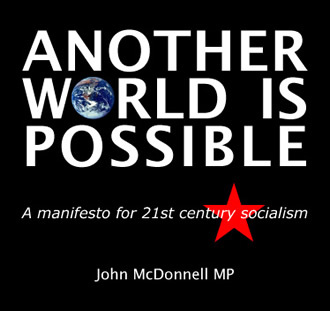 McDonnell in his little book, Another World is Possible – a manifesto for 21st century socialism challenges all the fundamentals of New Labour, and all its so-called achievements and puts forward, as an alternative, a set of new ideas, principles and policies that fly in the face of the present official agenda. Even without an election, his manifesto will have an impact. It will touch a chord not only with many present and former party members but potentially with many more outside who are involved in campaigns on climate change, the defence of the NHS and other services or who oppose corporate-driven globalisation. Crucially, the manifesto articulates their concerns and shows where New Labour has come from, what it is, as well as the consequences of its policies. The McDonnell manifesto explains what has happened during the 10 years of the Blair government, and why it is that New Labour (Brown included) will always defend the status quo and will never challenge the big global corporations and banks, why they will do nothing about climate chaos, and why they will continue to fall in with the requirements of the rich and powerful on all issues. Few, if any, on the Labour left have, until now, attempted to understand the changed world of globalised capitalism. They have clung to the past, basing their outlook and policies on the period of the 1970s and early 1980s. They confine themselves to a parliamentary outlook when it comes to elaborating how change takes place, even imagining that the real force for change can only originate in the corridors of Westminster. And they restrict their politics to a deluded faith that the left, with the help of the trade unions, can somehow “recapture” the party, whereas in the real world it has never been under the control of the left in its entire history. They also fail to understand the evolution of the Labour Party since the Second World War. The health service and the other gains of the 1945-51 Labour government are now being rapidly undone by the same party that brought them in, though it is now a party transformed into a body that directly serves capitalism in its globalised form. Even by the late 1960s, Labour was attempting to bring in anti-union laws as the decline of British capitalism produced a crisis that could not be solved in the old way. From the mid-1970s, Labour set out to confront workers and was finally thrown out of office by a strike movement led by low-paid public sector workers. And now we have a government that scorns the idea of representing labour. McDonnell’s manifesto, like a thunderstorm, clears the air, and provides a glimpse of the truth, and a hint of what might be in the future, alongside an exposé of the past 10 years. McDonnell implicitly acknowledges that the golden age of achieving reforms through pressure on national-based capitalism has gone, and that to challenge the power of the corporations will require a mass movement that breaks new ground in its composition. The manifesto is worth a closer look. Its opening section examines the nature of the globalised economy and identifies it as something new as compared to the 1970s. “The global economy operates in a way that is largely indifferent to the existence of borders and states,” it says. The new conditions have given rise to transnational corporations of immense power which are no longer controlled by national governments, but by new institutions such as the World Trade Organisation, the European Union, the World Bank and the IMF. “While New Labour claims that everyone shares in the benefits of globalisation, the real picture is quite shocking,” the manifesto declares, and refers to “the victims of New Labour’s ghastly social experiment and love-affair with corporate power and markets”. The victims are here in the UK, where, for instance nearly 4 million children live in households classified as poor, and where 2 million pensioners live below the poverty level, and in the developing world where 1.5 billion people are even without safe drinking water. And in Iraq of course, where “the market economy was, in effect, introduced by force of arms”. As a consequence of this ever-closer integration of the state with the outlook of markets and commerce, individual rights and liberties have come under attack. And now in Britain we have detention without trial, an unprecedented CCTV surveillance system, the criminalisation of young people with the use of ASBOs, the alienation of minority communities through the so-called “war on terror” and the isolation of asylum seekers. In the section on inequality, McDonnell puts forward an astounding set of statistics, including the fact that today in Britain the richest 1% of people hold 34% of the national wealth while the poorest 50% hold only 1% of the wealth. The uncontrolled ravages of globalisation and the vagaries of the market are partly to blame for this, but, says the manifesto, “it is also a direct result of government policies, which from Thatcher onwards, have systematically redistributed wealth from poor to rich”. The manifesto shows how these inequalities produce a string of social problems, from rising crime levels, homelessness, anti-social behaviour, poor health and depression and demoralised pensioners. The manifesto calls for redistribution, not just of wealth but of resources and power. McDonnell returns to the theme of the effects that rampant commercialism has on the people at the sharp end. The incidence of stress, alcoholism, anxiety, depression have all soared as the work-rate has increased in a culture of constant cost-cutting, outsourcing, privatisation and redundancies as jobs are moved to areas of the globe with cheaper labour. Market-driven consumerism fuelled by endless credit and loans (personal debt stood at an astronomical £1,300 billion in the beginning of this year) is taking a heavy toll, the manifesto suggests. And with the welfare system in crisis, housing unaffordable, the public services no longer public, and the trade unions largely docile, there is a general feeling of insecurity, powerlessness and alienation. Apart from everything else this has led to a growing political disaffection, with a distrust of politicians and parties in general and low turn-outs at elections. The manifesto calls for a new constitutional settlement for the 21st century. By developing an explicit democratic framework of civil, social and political rights, people would be able to take more control of their lives and society could then begin to move away from the crude consumerism that is ruining so many. A modern constitution should actually provide the means for holding elected politicians to account, says the manifesto. It would restore full rights to organise in trade unions and there would be new rights to democracy in the workplace, enabling workers to put forward alternative co-operative forms of ownership. There would be democratic control of the mass media, the repressive asylum and immigration laws that divide communities would be abolished as would the power to detain people without trial, and plans for ID cards would be scrapped. The chapter on climate change and the environment makes many radical proposals and criticises new Labour for their lack of action and urgency, and for their current favourite option for reducing carbon dioxide emissions, which is to build new nuclear power stations, replacing one form of pollution (CO2) with another (radioactive waste). We need to re-structure the energy market, says the manifesto. The UK has a wealth of natural resources that lend themselves to renewable energy production which cause no pollution and which, once set up, are cheap to run. And power should be generated locally, as in Denmark, where it is much more efficient. To achieve this power will have to be devolved away from government and from the corporations, which profit from inefficient generation and from pollution. The manifesto also calls for bringing the railways back under public control “by taking the rail franchises back as they expire” and the creation of a transport system that takes freight away from roads and onto rail, and which also reduces demand for air travel. In the sections with international policy, McDonnell accuses New Labour of taking on the role, with the US, of “self-appointed global enforcers of the new world order, or rather disorder” and then lists a series of foreign policy disaster zones, starting with the invasion of Iraq in 2003, that have left Britain isolated and much more of a target for terrorists. McDonnell calls for the withdrawal of British troops from Iraq and Afghanistan, the establishment of a Ministry of Peace “at the heart of government”, the scrapping of the Trident project, unilateral nuclear disarmament, an end to hypocrisy and double standards, and an international conference on the Middle East, which Israel should be compelled to attend “or face a trade and sporting boycott”. "Existing technology, science and resources have the potential to find answers to the most pressing problems confronting humanity if they are made to serve society rather than profit. To succeed our new agenda can and must bring together a new, wide ranging united front for change. “This new movement has a vast resource of potential participants to mobilise into a force for change from above and below including community organisations, trade unions, environmental activists, those struggling for equal rights, human rights campaigners, the pensioners’ movement, students, young people, peace campaigners and the movements against global poverty and Third World debt." McDonnell has produced a comprehensive indictment of the New Labour project from within. It contains an analysis, a set of policies and a programme of action for changing the world. The New Labour experiment is unravelling and its leaders are vulnerable because in their actions and policies they stand exposed as the friends of big business. The prevailing “Hear no Evil, See no Evil, Say no Evil” outlook of Blair and Brown and their apologists plainly no longer works in the present climate of rampant commercialism, war, grotesque inequality, climate chaos and possible meltdown in future elections. For all its strengths, the manifesto leaves key questions hanging in the air, principally the nature of political and economic power in Britain. But how can this transformation be achieved? That is the question that the manifesto side-steps. Power lies with the capitalist class and its agencies, primarily with the state and all those political agencies (including New Labour), that endorse the status quo. Challenging for that power, and taking it away from the political and economic elites, will require a mass struggle whose form we cannot predict, but whose aim must be to replace the present capitalist state with new democratic forms. This will certainly require the building of a revolutionary organisation to carry through. Labour was created to win reforms for workers through parliamentary action. That period of history has closed and New Labour is a qualitatively new political formation that does not allow socialists to participate, because it is so tied into a business agenda. So alternatives have to be thought out and strategies elaborated for achieving real socialist change that go beyond New Labour. Nevertheless, no Labour MP in living memory has produced such a comprehensive manifesto, one which is so well argued and with such a string of alternative socialist policies. McDonnell’s manifesto can only help to raise the level and quality of the discussion about the period we are living in and what to do about it, both inside his organisation and well beyond it.